To live life without emotions and not feeling anything is not really living but just merely existing. Our emotions make us who we are and they make us or do not make us act in a certain way or another. 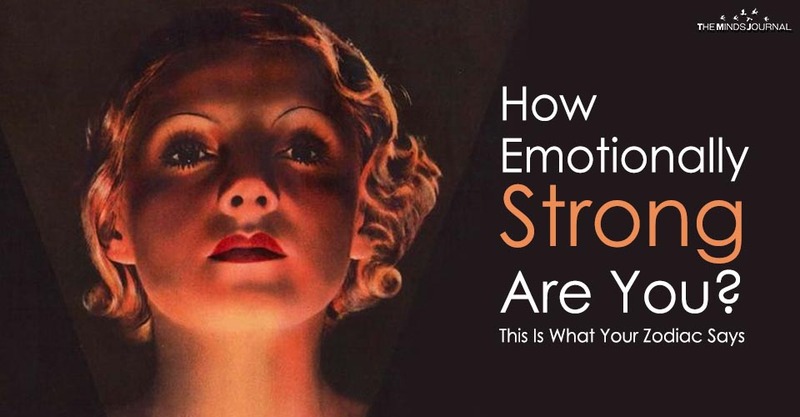 There are a lot of things that affect how we think but the prime element is always the emotion that is prevailing in our psyche at that moment. Being emotional is never a bad thing but allowing our emotions to rule us is not really ideal. Our emotions, especially when strong, can make us forget reason and do things that we would regret later. Someone who is emotionally strong will always know when to act on their emotions and when to just take a back seat and deal with whatever is going on in their minds and hearts on their own. They know exactly what would trigger them and how to avoid the trigger to the best of their abilities. You have a clear idea of what you want and in no case will you settle for anything less or participate in an activity that you have no desire to be a part of just to appease other people. You live life with an urgency, which means that you will not let time pass with you not doing what your heart truly wants and you do not care if that leads to some bitterness, because you are ready to deal with it all. You do your thing and nobody can change that. There are some walls that you have built up around yourself and it is that way for a reason. You do not want someone to come into your life and dampen your spirits because you know that you are too good for any of that. There is a lot you have to judge when you meet someone to be completely sure about letting them into your life. There is a party going on inside that incredible mind of yours at any given moment and in no way are you letting anyone else control you. You dislike people who make other people sad with their sadness, which is why you are always the farthest away from people like this and even if they manage to get near you, you make sure that you do not allow them to rain on your parade because frankly, it is the best one in town. Honestly, you love ‘love’ and if that is not admirable in these troubled times, I do not know what is. You have had your fair share of heartbreaks and betrayal in the past but that has not changed how you look at the world. You have held your ground through everything and have never even thought of giving up. This makes you emotionally strong, this ability to be vulnerable and to pick yourself up after you fall. You want good for the world and you make sure you do your part to make that happen. You donate, help and create with and for people who need your help and support and you do not do this just to impress people. This is just who you are and how you look at things. A Virgo always knows that life is about all the things that happen to us while we are busy making plans, which means that you can always trust them to show you the big impact that the little things make. They are not concerned about finishing a list, they are more concerned about having fun while finishing the list, taking their time and making sure they are happy doing whatever it is they are doing.